Today I am sharing a darling set of 5 Sweet Siblings with Hats images. These children are beyond adorable. I love their curly hair under all the different hats. There are two children in straw hats and three girls in fabric hats in the collection. I believe they are antique lithographs. 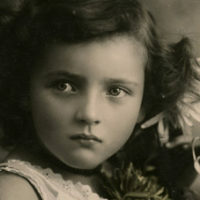 The vintage pictures of children in colorful clothing can be downloaded, printed, and framed. They would make a charming wall arrangement and a real decor statement. I also can see the antique drawings of children as a beloved junk journal focal theme. 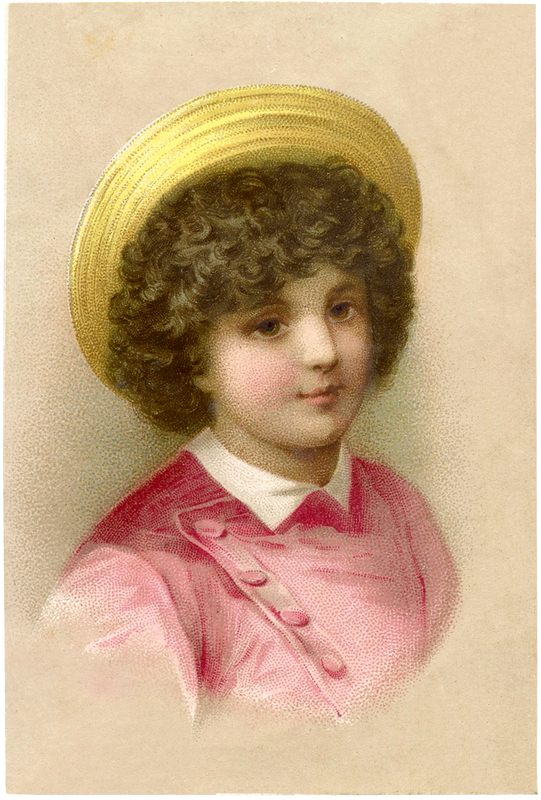 We begin our Set of Sweet Siblings with Hats with this cute Vintage Child with Hat Image! Shown here is a pretty little girl, wearing a blue dress and a straw hat with a matching blue ribbon! Her curly hair and big brown eyes just melt your heart. And such lovely soft colors on this one. Our sweet Sibling Set continues showing this adorable Vintage Girl with Bonnet Image! This is a pretty little girl with chubby cheeks and long curly hair. She has lovely big dark blue eyes. 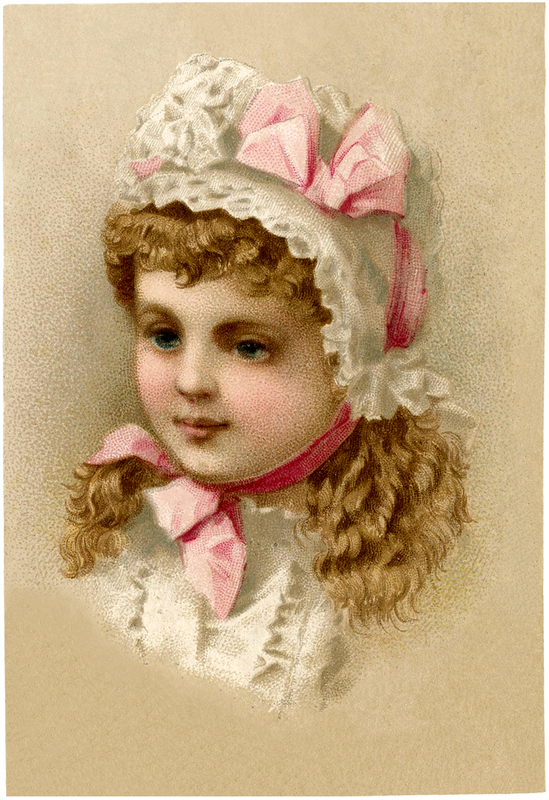 She is wearing a White Lace Bonnet with long pink ribbons tied under her chin. A pink bow sits atop the hat. Once again there are delightful soft muted colors on this one. 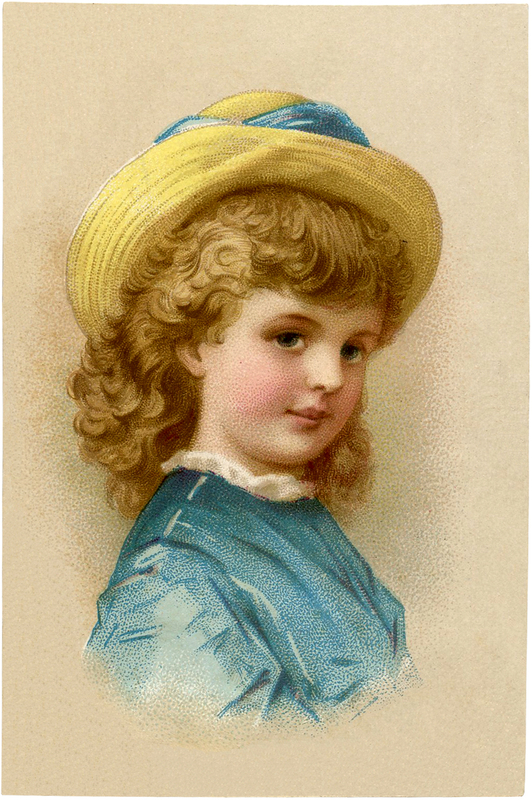 How delightful is this beautiful Antique Child with Hat Image! 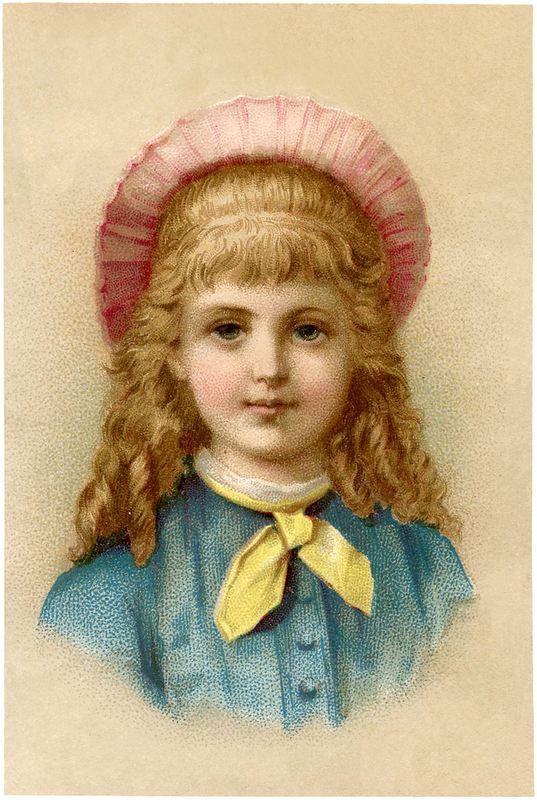 Shown here is a pretty little girl with long, soft, curly strawberry blonde hair done in ringlets. She is wearing a blue dress with round blue buttons. There is a yellow kerchief tied around her neck. She wears a ruffled pink hat that goes around her head like a halo! Her face and eyes are mesmerising. She is truly beautiful, isn’t she? I just love this pretty Vintage Girl with Pearls picture! 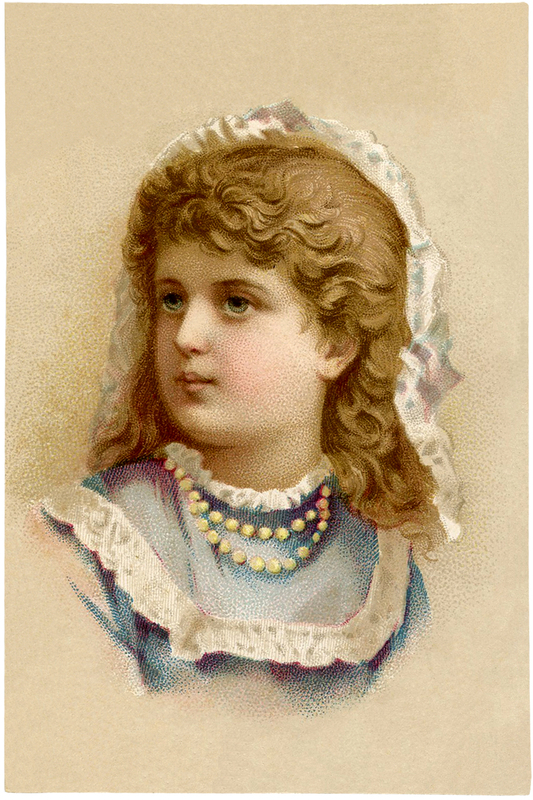 Shown here is a sweet little girl, wearing a double strand of pearls around her neck. Her head covering looks to be a white lace veil of sorts. Her soft blue dress has a square white lace trim on the bodice and shoulders. We conclude our collection of Sweet Siblings with a Charming Child with Straw Hat Image! Shown here is a sweet child with soft brown curly hair wearing a golden straw hat! Even though he’s wearing pink, I think this one is supposed to be a boy. The pink jacket looks like it is made of velvet. It has four covered buttons on one side of the coat. He has a dear face. Again, this one has lovely soft colors. I hope you enjoyed this curated collection of 5 Sweet Siblings with Hats Images. You might also like our 4 Tulip Soap Advertising Cards with Children Images! « Valentine Printables – Labels – Flags – Cupcake Toppers! I am new here. What a beautiful blog! Such a treasures! Thanks for all the hard work you do to enable us to download and use all these nice images! I am an older subscriber. I am not sure how to print these freebies and use them. I have a tablet not a computer. Will u please please advise me how to do this at the library. I need this information because i feel i am missing out on great opportunities. Thanks for the help. To be able to print the images you need to click on the image which enlarges it for you, then click the right button on the mouse, then click on the option save as, name it what you like and click save. It is then saved to the computer and you can then pull it up and print it. I am sure there are people at the library that will be happy to help you with this 🙂 Good luck!